A. Update Firmware. Update to the latest firmware version. 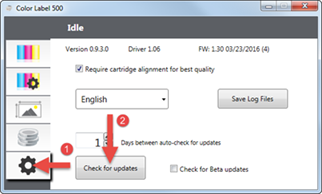 You can update firmware within PTPublisher or the Status Monitor. B. Clean the Cartridge. If the cartridge has not been used for some time it is possible that the inkjet nozzles may dry out. 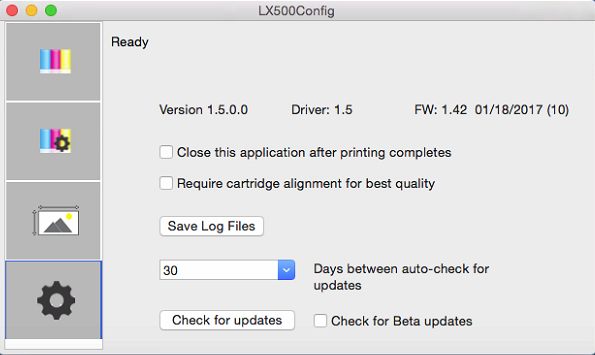 Remove the cartridge from the printer and follow this procedure to manually clean the cartridge. 1. Fold a paper towel several times and completely saturate it with warm water. Do not squeeze out excess water from the paper towel. 2. Press the cartridge nozzles to the wet paper towel for 1-5 seconds. 3. Tap the top of the cartridge firmly with your fingers. 4. Repeat until all three colors are visible on the paper towel. Watch this Video for a demonstration of the cleaning process. C. Check the Maintenance (Capping) Station for ink build up / Replace Wipers. The capping station is where the cartridges dock when not printing. The rubber cap just naturally builds up ink over time. There can also be ink residue on the wiper. Wipe off the capping station components occasionally with a damp cloth. The components that need cleaning include the cap itself as well as the rubber wiper just to the right of the cap. If you notice that the first few labels/discs print fine and then the colors fade away, the wiper may actually need replacement. Wipers last approximately 30,000 prints. However, actual wear will depend on several factors including the size of the label you are printing. For this reason, the wiper should be cleaned and checked for wear every 10,000 prints. A replacement wiper can be purchased from the replacement parts store. SKU: 626367 Instructions for replacement can also be found on the parts store. 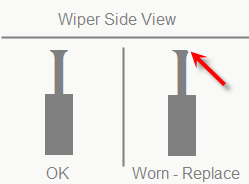 How will I know a wiper is worn? Note: These same symptoms can be caused by an empty cartridge. Please ensure the cartridge has at least 20% ink remaining. If not, please try a new cartridge. Note 2: Cartridges should be stored in the printer at all times to prevent nozzle drying. If the cartridge is left outside of the printer for even a few hours it is possible the nozzles will dry. Use this procedure to recover the cartridge.